Are you planning to take your Jabatan Pengangkutan Jalan (JPJ) Kurikulum Pendidikan Pemandu (KPP) computer test soon? This article will give you some tips to pass the test on your first try. After attending JPJ’s 5 hours course on “Undang-undang”, most potential students sit for the test on Rules and Regulations. Though this simple test can easily be attempted by most, nonetheless, some find this test slightly difficult to pass. Some failed this test by 1 or 2 marks. Thus, they have to attempt this test twice or thrice over. As such, my intention in writing this article is to provide tips on how to pass this simple yet intriguing test at first go. First of all, I’ve been involved as a lecturer for many years. Therefore, I feel I have the experience and expertise to help those facing this predicament. The paper itself is divided into 3 parts. 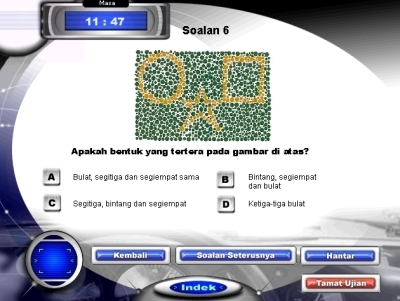 Section A (the undang-undang section consists of 15 questions). Actually, this is the easiest section of the three. One should attempt to secure ALL 15 questions correct. To pass, you should not make any mistake at all. Section B (on Panduan Berhemat or Prevention of Accidents) comprises 25 questions. Questions are a little longer and slightly more difficult. Nevertheless, study this section carefully. Being more difficult, you are therefore permitted to make 3 to 4 mistakes. But remember, nothing more than that. Now, coming to Section C.
This tests a student on what’s called the A.P.J 1987 (Akta Pengangkutan Jalan 1987) and the “Demerit System“. Many students ignore this section completely. That is where the mistakes lies. My advice is – this is where the problem exists. These two topics is the keystone to being a good driver. So study well these topics. It’s not only important to the potential driver, but it is also the gateway to securing a PASS. Again, remember not to make more than 2 or 3 mistakes. Bearing in mind you have made no mistakes in Section A, only 4 mistakes in Section B. And in Section C, 2 or 3 mistakes. Thus, with a total of 7 mistakes made, you are on the way to securing 42/43 marks required to pass this problematic test. Before approaching this test, make sure you are competent in computer. Seek your driving instructor or Institute’s assistance if you have to. May my advice to you be of little bit of help to potential “L” drivers. Kenapa Undang2 M’sia tidak berkesan?..Skg ramai org tak patuh traffic light. Ini merbahaya kpd pegguna lain yg tak bersalah. I wish to enquire if my Commercial Vehicle No. BDK****(Toyota land Cruiser HZJ80R) can install the tint on the windscree glass. I sent my vehicle to the Puspakom for inspection (Official Resit No. 6140*** & Test Sheet No. A5166***) today at Puspakom Mak Mandin, Penang and Puspakom failed the vehicle solely for the windscreen glass tint which was installed some 8 years ago. In the past I managed to get through the Puspakom Bi-anual tests without fail on the tinted windscreen. If such commercial vehicles are not allowed to install tint on the windscreen at all then I would abide by the ruling and dismantle the tint. However, if such vehicle are allowed the tint installation with certain test criteria then I wish to send my commercial vehicle to the relevant JPJ or Puspakom test centres for test again because the Puspakom tester did not use any equipment/apparatus to test the tint but merely said tint was not allowed. I believe the tint on the said commercial vehicle belongs to the allowable level and that is why I wish to check out. I sincerely hope that JPJ can assist me with my enquiry and contact me at the above-mentioned email address. Thank you for visiting our blog. Please be informed, this blog is not associated with Puspakom in any way whatsoever. I am seriously very confused. I am taking the computerised test in a few days and whatever resources given by the driving school make me pull out my hair. FIrst of all, my Malay is very poor as I have been living overseas till recently. Secondly, the English version of the KPP book is so thin as compared to the Malay one. Thirdly, THE ENGLISH IS SO BAD!!!! The grammatical errors, vocabualry mistakes and spelling errors are annoying me. I mean if u’re going to provide us with the option of taking the test in English, please ensure the resources are accurate. There are so many errors that I feel like just forgoing the test. Even the first day course I attended was all in Malay. Is there a proper English version of KPP? I feel like writing in to JPJ about the quality of the English resources though I doubt they will do anything about it. Someone please advise. J.P.J. in fact has a K.P.P. book in English comprising approximately 150 pages. Obviously, your driving school has failed to provide you the above. You should have requested your K.P.P. lecturers to use “bi-lingual” for your advantage. However, whether the lecturers can do “bi-lingual” or otherwise is unknown. Your dismay over the entire K.P.P. is most understandable. My advise is, don’t give up so easily! Ignore grammatical errors, spelling mistakes, vocab inefficiency, whichever annoy you. A driving license is important. No matter what, you should attempt to get it. Seek your instructor’s help. The K.P.P. English version should be available from the van selling driving school materials. It comes on test days. I understadn completely how Fathimath Feels. I tried to get the English version fo rmy husband who is a foreigner and do not understand Malays Language. We registered with Inmaju (Seremban) as we heard they are handling all the driving test and such however the book (english version) is beyond words I can hardly understand what the question is my self. and it is a very simplified version o fhte malays book given. My husband took the test 3 tims and failed due to not being able to study the questions asked. there was nothing in the thin english book version that were tested other then the road signs. We went to the driving school and they said there is only this english book available and no others. We went to JPJ in Seremban and they said the new english book is not in stock anymore. So how can my husband get tis book? Any suggestions Cikgu? Saya nak ambil lesen memandu. Tapi saya takut akan kegagalan dalam ujian warna. Bagaimana saya ingin menghadapnya? hadiri kursus K.P.P. 5 jam. Semasa hadapi ujian komputer, anda akan hadapi ujian buta warna. Hendaklah positif. Belum tahu lagi lulus atau gagal. esok saya ambil test computer uutuk lesen L. Saya takut tak lulus untuk exam nie..macam mane saya nak tangani masalah nie??? Anda haruslah merasa yakin! Cuba jawab semua soalan. Tumpukan lebih perhatian kepada Section C (A.P.J. 87, Mata Demerit). If your English is better, do it in English then. saya pernah dikenakan saman sewaktu berumur 17 tahun atas kesalahan tiada lesen memandu kereta,tapi masalahnya saman itu saya dah bayar 2 tahun lepas..tahun ni,lesen p saya dah matang,so saya nak tukar utk lesen penuh,tapi kenapa saya still diblacklist lg utk saman 2?? ?mungkin sebab saya bawah umur ke masa itu? ?boleh tak cikgu bagitahu saya syarat saman memandu bawah umur utk budak yg umur berapa??? Adakah resit bayaran saman yang telah anda bereskan? Sekiranya ada, pergi ke pejabat J.P.J. berdekatan untuk selesaikan parkara ini. I am looking for computer Test in English on Google, but I haven’t found it. Pls tell me where to get it. Can I get it the CD for Computer test? The computer test book in English & CD can be obtained from the van that sells driving school paraphernalia. It comes to the institutes only on test days. Make arrangements with a driving school instructor to assist you. Hi, does the Enlgish & CD available in all the driving test institutes in Malaysia ? I am in a small town Muar and going to Tangkak driving center, my driving instructor told me there is no English version. Any advice ? Thx ! Your instructor is unfortunately correct. English test books and CDs are only available from the van that comes to institutes once a week. I’m taking my undang test tomorrow, and I’m taking the English one but there’s no text book for the English version, there’s only a thin yellow book consists of the questions and answer, is that really good enough to help me pass the test? And compared to the Malay test, will the English one be easier or more difficult? Your fate is in your own hands. And knowing there are few materials for English, yet you still choose it, well, what can I say? but then wen im eager to drive back and so i go and renew my license which was ard another1yr later i thk,only then i find out tat i cant renew it already. so here,i want to ask is it i must retake the course about everything of the course which is the undang-undang, whatever test, driving on the road and etc?? this because i’m working now and its hard for me to have anytime to take the course, everything from the starting again and i also have financial problem. Your license has become null and void years ago. Though cost of taking a license has escalated to Rm700 – RM1000, you rally have no choice. You have to start from scratch and do everything all over again. Even though I would like to help, nothing much I can do except symphatise with you. there is one thing im wondering , i passed my undang test this month n im 17years old but haven reach my birthday that day i took the undang test ! then ! after my birthday , i went to khursus 6hours , for car one …then this uncle , told me that JPJ asked me to attend the motor khusus 6hours as well only can get my L license !! i was like WTH? is it how it works cikgu yap ? You need not attend the motor 6 hour if you don’t want to. The choice is yours. Terserah kepada anda kepada siapa anda ingin mematuhi. Hello, like cheesun, I took the undang-undang test before i turned 17. Will my results be valid or is there a rule stating that you have to be at least 17 to take the test? It would be a real inconvenience if I would have to take the test again when i turn 17. Also, if i fail to place the P sticker on my car, i would get a demerit of 10 points, but what if i am driving someone else’s car since i don’t have a car of my own? Thanks a lot Cikgu Yap. Your undang result will last 1 year. If you have a car of your own or the car you borrow has No “P”, don’t drive. I really liked the tips for passing Undang-undang driving test. Mentioned mistakes in the two key points are noticeable. I wanted to know if it’s possible to register,and do my driving tests and everything required to get my P on weekdays,because i work on weekends. I would like to know if this is possible,and im sorry if this question is quite trivial,but thanks so much for your help. Many instructor would jump for joy that you can learn during weekdays. I wanted to know is there any rules stated that we cannot u-turn at the traffic light? If there is a sign saying cannot u-turn of coz.. no doubt we cannot u-turn but there NO sign board saying cannot u-turn. I need help as this police give me a summons.. Quoting British rules used prior to Merdeka, you cannot do an U-turn round a traffic light. The Police are right in giving you a summons. Serahkan saja tugas kepada pensyarah-pensyarah institut. Before the questions, sincere thanks for having this blog – I have looked over a number of the threads here, and you have already answered many of my questions. I hope you can advise me on how to proceed? I received my USA driver’s license back in the 1980s, when i turned 16. I kept it valid through university, and when I first moved to South Korea. When it was close to expiring, I registered it with the South Korean government, and was given an exchange license ( a paper one) that was valid until I left Korea, a little over 3 years ago. When I came to Brunei, the govt. here did almost the same thing – they took my expired USA license (although at that time my IDL was still dated valid), and also issued me a Bruneian ‘exchange’ paper license. Now I have been offered a job in Malaysia – up in the north peninsula side – and according to my contract, I have to be able to drive there,to get to my assigned schools and meetings. * I cannot get another USA license (my DMV informed me), because I don’t live/work/own land/have a bank account in my old state. I have been an ‘expat’ for too long!!! * My paper Bruneian license is about to expire in the next few days, and my job in Malaysia starts the beginning of January. 1) try to extend/renew my paper Bruneian license, and use it there initially? Can I get a Bruneian ‘paper license’ changed over, or use it until I take the courses for a Malay one??? 2) take the actual Bruneian driver’s course here in Dec, before I go to Malaysia, to get a Bruneian card license? I know there is a FLOOD of new foreign teachers coming into Malaysia this next year, so any help is most appreciated! I want to be a legal driver/rider there!!! Renew your Brunei license before coming over to Malaysia. Try converting your Brunei license into Malaysian license when you’re here. If unable to do the above, then only attempt to secure a Malaysian license later. Cikgu Yap, is it possible to drive barefoot during jpj test? Coz, i can drive (only no license yet) but with barefoot..
No, Angela, No! Learn to use your shoes! Cikgu Yap, I just wondering if every sifu also that fierce? I just completed my 6 hours lesson & the sifu who in-charge of teaching have a very impatient & extremely fierce all the time during the lesson. I have find trouble in concentrating when he was scolding me at the same time. I was just wondering is it alright to requst my driving academy to change others sifu to me? I’m kinda stress & find it a phobia to learn driving whenever i think of facing him. The answers for the yellow book that comprises of 500 questions are wrong!!! What am I suppose to follow? I just came across your good site. I believe you are not only a good driving instructor but also good in teaching defensive driving. I have simple questions to you just for my son,18+ who would like to learn driving motorbike and car. I understand first he has to pass the Highway Code Exam to obtain the “L” license. I also understand he needs to attend the JPJ’s 5 hours course on “Undang-undang” before sitting for the exam. MY QUESTIONS: (1) If you can answer sincerely – Can my son register for the Highway Code Exam on his own and take the exam on his own without going through the driving school? After he passes the exam and obtains the “L” license, then only he goes through your driving school to learn how to drive. Your comments are appreciated. The answer to your questions are al in the affirmative. I suggest you go to a driving institute. Enrol for the KPP course, settle whatever changes the institute impose. 2 – 3 days after attending the KPP course, your son can proceed to a computer test centre in town to register to sit for his computer Highway COde test in either English or BM. Computer centres are opened 7 days in a week, from 8:00 – 5:00pm. Should you face any centre which disallow your son to register to sit for his computer test, I suggest you be adamant with them. If in any circumstances you are not allowed to do a walkin test, inform the clerk in charge that you’ll make a report with the Road Transport Department (JPJ). Test registration fee is RM27 Computer test results are issued immediately after the test. Armed with the results, go back to the driving institute where you did your KPP course to enrol for the next course which is the 6 hour theory class for either motor or cars. If you need to take up both motorcycle and car license, then you’ll have to attend both the classes. Obviously, you’ll have to pay for the costs of the classes to the institute itself. On completion of the above mentioned theory class, get both the documents, that is Borang 4 from the institute to enable you to take out your “L” driving license.The procedure towards getting an “:” license is a long and tedious process. Hope your son will face no problems in attempting to get an L license on his own. (1) Is the Computer Highway Code Test, the same test paper for car and motorbike? If it is the same, I guess the fee is only one, ie RM27 you mentioned above. Meaning to say if my son passed the computer test and attended both the 6-hour theory classes for car and motorbike, he is qualified to apply for the “L” license. Is this correct? (2) I understand my son needs to attend the KPP course first before enrolling in the computer test. After the KPP course, if my son goes directly on his own (not through the driving school) to a computer centre to register for his computer test on Highway Code, what does he need to bring along and how the computer centre is going to know that my son has completed the KPP course via the driving school? (2) By the way, what is an “:” license? (3) Here, I noticed a book “Jom Belajar Memandu” costing RM19. May I know is this book written by you? Is it everything in English? (4) Is “Borang 4” the blue card? (5) I am staying near Bukit Jalil and very near to Sungai Besi LRT, do you have any driving school of yours nearby where my son could learn driving from a good English-speaking and skillful experienced patient instructor? Hope not too much for you. Thank you once again. 1) Computer Highway Code same for motor and car. When applying for above test, do not forget to bring along your MyKad. Also remember to tell the clerk your son wishes to sit for a class D computer test. When your son passes the above, it will automatically cover B2 as well. 2) Yes, your son has to attend KPP before he can proceed to do his computer test. Attendance to KPP class at the institute is “online” to the computer test centres. The above centres will automatically know of your son’s attendance. 3) I meant L license. Typing error. 5) After attending the 6 hour theory class, your son has to get hold of the attendance certificates to the B2 and D classes. It comes together with Borang 4 issued by the institutes. 6) When your son has finally successfully gone through his Highway Code test, do feel free to contact me again. I’ll arrange with my English speaking instructor to help your son’s learning needs. Finally, while at the computer test centre, your son has to pay RM10 for his computerised photograph. Hope I have succeeded in answering most, if not all of your queries. You answered well. Thank you. Prepare well for your exam. BM or English makes no difference. Hi cikgu yap, I am planning to start driving lessons soon but I am a bit confused about the undang course and test. Firstly, is the course held at driving schools or JPJ? Second, do i start attending the driving institute after or before the Highway Code test? Dear John, Firstly do you 5 hour KPP (Undang course) at institutes. Then do your undang test at private computer centres. I’ve failed the test twice already… So fed up taking the test over and over again… I was given a Malay book to study but my Malay is poor I can only do the exercise in Malay and take the test in english. Any advice? Should I take the test in Malay or in English again? I am Hari an Indian Working in Singapore(I am not a Singaporean nor a Singapore PR), I would like to learn car driving, as here in Singapore it is very expensive(out of my budget). I have tourist visa to Malaysia for about 8 months, and i can travel to JB on weekends, if there is any possibilities that i can learn car driving there (it would be great if i can get a Malaysian Driving license) please let me know the price and formalities. I have MCWG (2 wheeler driving licence from India). Thanks for your needful help. Dear Hari, The possibility of your desire to learn up driving in Malaysia are good. Yap. Hi Cikgu, I just wanna ask. I got my driving license for the past 8 years and I’m still driving. Now I am planning to take motorcycle license. I planned to take L first. Do I need to take the undang test again or I can straight apply the L license. Take undang test and get new L out. Thanks for the information you’ve provided on the blog. The MPH bookstore no longer has your book. I already tested twice , the frist time is 36 second time i double check 38 . Whats wrong with me…? Learn in greater detail. Read the questions and answers given carefully before choosing the answers. Hi Cigku Yap,im very dissapointed i feel like i want to give up my undang undang theory test..
Now i feel confused becaused every computer here in labuan is not having the same questions..
From first seat 1 to 5 different question in it.. I am a Malaysian citizen but I did not study in Malaysia, so I have difficulties in understanding Malay, so can I know how I would get a manual in english instead of Malay.